Saturday I met up with a good friend of mine to do dinner and a movie. We ended up eating at Mercer Kitchen, one of my favorite spots in NY for the great food and chill atmosphere. Jean-Georges who owns the restaurant, is an amazing restaurateur and is truly an inspirational chef. I would definitely recommend it to anyone who's looking for a quiet place to have dinner -- plus it's a great date spot! I decided when I was getting dressed that I wanted to wear one of the headbands that I have in my ever growing collection (mostly impulse buys) because they never get that much wear. 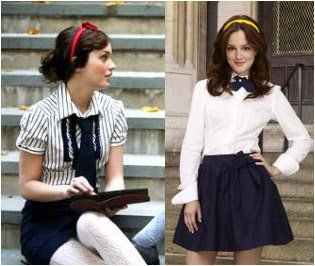 After Gossip Girl has come out though and became furiously popular, I feel like I can't ever wear my headbands anymore without feeling extremely Upper East side à la Blair Waldorf. Maybe that's why I stopped wearing them so much -- it's funny how articles of dress can symbolize an entire fashion subculture. I'm wearing: Chloé sweater, blouse and motorcycle ankle boots. Headband from Barneys Co-Op. Skirt from Intermix. It's still winter in New York so I had to wear a coat -- but that's okay since I have quite a coat fetish. I was happy to see on Who What Wear recently that Claudia Schiffer has the same coat!! Sorry for the crappy photo quality! Bf was working and couldn't take photos for me. Must invest in a new DSLR + camera stand.